GM's first mass-producible/mass-market electric car, the Chevrolet Bolt EV sets new standards for viability with potential real-world buyers thanks to its class-benchmark 238-mile-per-charge range. Natural rival to the Nissan Leaf and more affordable than a BMW i3, this cleanly styled, well-finished compact hatch boasts impressive room for five, a sporty demeanor and features that rival those of many pricier conventional vehicles. It's Electric. I pay less than $30/month in added electricity to run my car. It's electric. That's super awesome, not paying for gas. The range is good, I never have range anxiety. The seats need improvement, as does the infotainment system. The car can be naggy, and makes assumptions about what I want (like automatically turning the radio on). The are also less than ideal, though I'm not sure what the path forward is. Stuff always ends up bunched on the left side of the windshield near the center of my vision. No more gas stations! Easy to maintain - no oil changes, radiator overheats, etc. And with regenerative braking, very little brake work. Just rotate the tires. I like a full electric vehicle like the Bolt. It has great range. And I don't miss gas stations! The seats are comfortable. There is enough head and leg room so that it doesn't feel like a small car. Passengers in the back are not cramped. There is plenty of cargo space. It runs very quietly and cleanly - no gross exhaust fumes. Maintenance is very easy. My only complaint is that there is no CD player. No worries about distance and never worry about gas prices again. I love the convenience of being able to drive without ever having to worry about buying gas. By charging overnight and pairing with my solar panels, my coat of ownership is minimal and my electric bill has actuaLly dropped, thanks to time of use billing. The range is amazing and the power impressive. I'm in love. 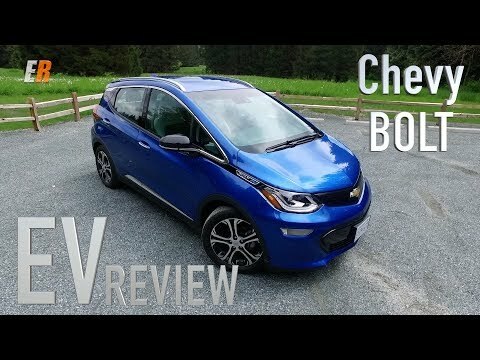 2017 Chevrolet Bolt EV Review - What&#39;s it Like Living with it?